I was born in Lovere, Bergamo, October 29, 1986. I am graduating in 2009 at the DAMS of Bologna curriculum cinema. I then moved to Rome to subscribe to NUCT International School of Film and Television, where I obtained a diploma in filmmaking. Then I attended an advanced course for filmmakers at FW MURNAU: high school specializing in fantasy films. During my studies I participated in different sets in which I have held various roles from director to assistant director, in the production. 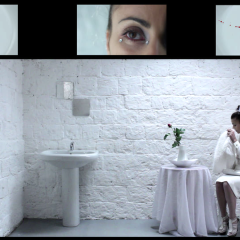 I wrote and directed three short films: "Libidia" 2008, "two" 2010 , "Reflections on the cinema.2011" Temporarily turn the experience "shorts" I approached the video art by producing two projects "The Show" and "Water by Woman"
Observe images as a tear in the flesh, a body lying on the ground after an accident or a crime scene produces an unexpected sense of pleasure. Curiosity, voyeurism of the body, breaking of observing "what you can not watch"? The explanations are different but all with one common denominator: the pleasure of seeing. This enjoyment, however, is often dusty, hampered by fears that are inherent in human opinions, in the eyes of the next that make us feel guilty for pleasure taken from the suffering of others. With "The Show", the user has the opportunity to enjoy these images, but annihilating the guilt that comes. Through their insertion into the circuit and artistic, estremizzandone the aesthetic potential, these representations are emptied of the value of truthfulness, nullifying any sense of guilt. Following the current media spectacle of crime, here is the need to show a crime scene that seems to have all but the dictates of a situation from the red carpet. Ongoing investigations into a crime scene are transformed, after the entrance of the press, in a kind of fashion show. Those who represent the body of information are shown with eyes and lips enlarged to represent the power of the media. A detective and his "curly" secretary, apparently devoted to work, can not resist the flash of photographers. A woman lies helplessly on the ground. Around it, a surreal environment. A young couple stops, approaching the corpse. The young man had an accident to an unexpected passage of toads on the way he was running. The body is beautiful, in line with the viewing experience. The voyeurism inherent in each of us is told by the girl's family, while his partner is a carrier of the morality that does not allow us to enjoy this view. The scene as the predominant color white allowing the red blood and rose petals stand out even better. Everyone has the flavor of a rite of something studied in detail as a true staging that is made explicit with the use of a blood visibly fake: a bright red, and of a massive texture. The interpreter is dressed and made up as a model to remove the thought from ordinary woman. A woman for whom we might have to feel guilty. The symbolic dimension is ubiquitous and is an integral part of our lives. Woman in Water by I examine water as a symbol, and makes explicit in describing it through the body of the woman. A woman is lying on a carpet of earth. Rain falls on the ground moistening and wetting the body of the woman, both enjoying the fecundity of the water flow. The woman becomes the voice of the earth showing that pleasure that she can not express. A woman is completely painted black, impossible to distinguish in the darkness of the room. Drops of water falling on her body and purifying it slowly redefining its presence. The water is the image of the movement, of the succession of events that create life. A woman moves on a wet floor, plays, dance, desire that expresses through the body of what appears to be one with the water. The pauses are few, there is a continuous flow from start to finish, different movements but sometimes repeated as the experience of living.